With a line-up featuring prominent names within the Sydney metal scene, five-piece melodic death metal act Daysend had the potential to create something special with their debut offering. And sure enough, 2003's Severance delivered just that. Critically acclaimed from both national and international press alike, Severance immediately presented Daysend as a truly dominant force within the Australian metal scene, and eventually led to deal with Metal Blade Records in the U.S. (In May 2004), followed by a six-week North American tour in support to Otep the following year. Eager to keep the momentum rolling, the band started work on their follow-up release in early 2006, but faced a huge set back when vocalist Simon Calabrese announced his departure from the group in May. 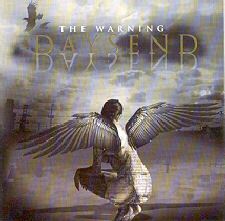 Undeterred, the group (Guitarists Aaron Bilbija and Michael Kordek, bassist Meredith Webster and drummer Wayne Morris) soon found a replacement in ex-Headcage front man Mark McKernan, and once again entered producer D.W. Norton's Backbeach Studios to emerge with their sophomore effort The Warning. The briefest of build-ups is utilised for the start of Shoot The Messenger, but it doesn't take long for the band to announce their intentions with some fast paced riffs and dual harmonies mixed with thundering drums, but it's McKernan's presence that really shows the dramatic change of direction from where the band left off four years ago. On the clean side of things, McKernan proves to be every bit as capable of matching Calabrese efforts on the band's debut, but on the screaming moments, McKernan shows off his own unique style, which gives the group an aggression that was only hinted at before. The spoken word effect McKernan uses in the verses of Scars Remain is quite effective, and works at offering a counterbalance to the huge melodic chorus; while a similar formula of aggressive verses intermingled with huge sing along choruses work the strongest in tracks such as Between The Hammer And The Anvil, This Is A Warning and Passenger. The single No Regrets (Which is the first song on the album filmed for a promotional video clip) shows a slight change of direction for the band with some of their thrash influences standing out more predominant within their melodic death metal framework, while it's on Winter (Which is preceded by the short and atmospheric guitar instrumental V) and Breathe It In that the band slow things down, and allow McKernan to really show off his impressive clean vocal abilities. Sadly, the remaining three tracks, although still quite strong, seem to be lacking that something special in the choruses to lift them up to the same level as the tracks mentioned. After a four-year wait, The Warning is a certainly a worthy follow up to the critically acclaimed Severance, but it does fall short of eclipsing it overall. There's an obvious progression within the musicians abilities, and McKernan is more than up job of fronting the band, but I can't help but feel that a few tracks miss their mark, leaving The Warning a little inconsistent in places. Having said that, The Warning is still a recommended listen for any self respecting Daysend fan.